Ye Season continues with what will be remembered as the most uplifting, cohesive, spiritual, and sonically excellent episode of Kanye West's serialized works. Ye Season 2018 reached its halfway point with Kids See Ghosts, the long-awaited collaborative work between Kanye West and Kid Cudi. It's been a journey. The preseason was loud, contentious, and full of dialogue on political issues. The opening remarks, however, served to silence the hate and the politics as the music took over on Pusha T's DAYTONA and West's ye. After a short-lived beef with Drake and mixed opinions on West's follow up to The Life of Pablo, the saga continues with what will be remembered as the most uplifting, cohesive, spiritual, and sonically excellent episode of Kanye West's serialized works. The spiritual has always been a point of interest for West. Gospel music has been a key ingredient to his iconic production as he's sampled and interpolated the genre in everything from " I'll Fly Away" off The College Dropout to "Ultralight Beam" off The Life of Pablo. But it's not just the sound of the spiritual that has affected West's deepest and most heartfelt works. The need for God and the temptation of the devil play pivotal roles throughout his entire discography from "Jesus Walks" to much of My Beautiful Dark Twisted Fantasy and much more. 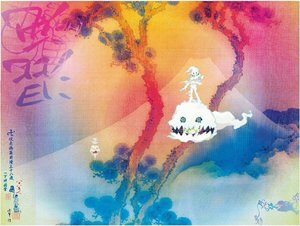 Kids See Ghosts continues West's tradition of tapping into the supernatural and takes it to its most redemptive and jubilant state ever heard in his discography. However, where the legend Ray Charles controversially took sacred music and secularized it, West has perfectly taken the secular and consecrated it. Nowhere to be found here are the gospel samples, chipmunk vocals, or triumphant sounds heard on the likes of "All of the Lights". Instead, the tracks are brooding, somber, psychedelic, and often capitalize on minor chord usage. And it's not just the juxtaposition of sound and message that makes this record interesting. It's the ability to over and over drop the unexpected and the experimental, like Kanye's manic snare beat scatting on "Feel the Love" or the use of Louis Prima's 1936 Christmas song "What Will Santa Claus Say" on "4th Dimension". But somehow it all combines with hooks that declare, "I can still feel the love", "I feel free", and "I'm so, I'm so reborn / I'm moving forward." West and Cudi (along with other collaborators like Ty Dolla $ign, Pusha T, and Anthony Hamilton) lift each other up and point each other towards a mental, spiritual, and musical state of goodness and excellence unachievable individually. What makes the overall uplifting tone truly pay off is knowing the stakes and the situations the artists see in their own lives and the world around them. West laments the heartbreak and violence which begets more violence on "Cudi Montage" over an acoustic guitar loop by Kurt Cobain: "Everybody want world piece / 'Til your niece get shot in the dome-piece / Then you go and buy your own piece / Hopin' it'll help you find your own piece…Just another cycle of the lonely / All growin' up in environment / Where doin' crime the requirement / They send us off to prison for retirement." It's been a long few years, full of more hopelessness in the news every day. But Kids See Ghosts seeks to change the narrative. It offers hope; it offers an escape from the stress and anxiety imposed on society daily. Whether you agree or not with West and Cudi's spiritual, loosely Christian, reliance on God to keep moving forward, seeking peace and salvation, the gospel message portrayed here is penetrating, much more penetrating than the majority of traditional gospel albums put out today. I think it is safe at this point to say that Kids See Ghosts will be remembered as the climax and most enduring record of Ye Season, one that keeps giving with each and every replay.